OBJECTIVES: To evaluate the possible change in teeth lengths as an indicator of orthodontically induced tooth root resorption (OITRR) after high-frequency mechanical vibration (HFV) treatment concurrent with Invisalign Smart Track® aligners as evaluated by cone beam computed tomography (CBCT). MATERIALS AND METHODS: The sample, composed of 30 patients with an average age of 26 ± 11 years and Class I malocclusion with an initial anterior crowding ranging from 3 to 5 mm, was divided equally into two groups; Group I received adjunctive high-frequency mechanical vibration (HFV); Group II, the control, did not receive adjunctive mechanical treatment. The maxillary incisor's teeth lengths were measured using Mimics software before (T1) and after (T2) treatment. All data were analyzed using Student's t-test. Reliability testing was completed by randomly selecting 10 patients' CBCTs, and their teeth lengths were measured twice by the same investigator over a 15-day interval and compared confirming intra-operator accuracy. RESULTS: The control group showed a statistically significant decrease in tooth lengths compared to the HFV group which showed nonstatistically significant change of tooth lengths. CONCLUSION: Patients treated with HFV showed minimum tooth length changes after treatment, which may indicate that HFV can reduce OITRR with treatment using clear aligners. A short duration of orthodontic treatment is desirable to both clinician and patient. However, fast orthodontic treatment might be compromised by pathological shortening of the dental roots (root resorption). Root resorption is one of the possible deleterious consequences of orthodontic tooth movement. Orthodontic forces are transmitted through the root to the periodontal ligament, resulting in areas of compression and tension with influx of osteoclasts (bone-resorbing cells) and osteoblasts (bone-depositing cells). For numerous factors, an imbalance between resorption and deposition may occur resulting in permanent loss of root tissue when the imbalance is tipped toward resorption. Treatment mechanics and force levels combined with individual biological variability and genetic predisposition all play roles in root resorption. Orthodontic tooth movement is often referred to as a “controlled trauma.” Achieving maximum biological response while minimizing deleterious effects and treatment time is an optimum orthodontic treatment goal. A split-mouth study investigating root resorption with light forces (25g) compared to heavy forces (225g) demonstrated that light forces produced significantly less resorption than heavy forces. However, even on the light forces side, as treatment time increased, resorption increased significantly. Many different techniques have been proposed to minimize orthodontically induced tooth root resorption, ranging from pharmaceutical agents to surgeries in attempts to coordinate patient biological responses with accelerated orthodontic forces., However, questions remain on the possible impact of accelerated aligner exchange protocols on the quality of tooth movement and on root resorption. Studies have been conducted to evaluate accelerated tooth movement in combination with low or high-frequency mechanical vibration (HFV) on the rate of tooth movement., It has been shown that complete aligner seating, delivering intimate contact between tooth surface and aligner, is required for optimum tooth movement using clear aligners. Therefore, this study aimed to evaluate the effects of high-frequency mechanical vibration (HFV) on tooth length in patients treated with clear aligners using SmartTrack® aligners provided by Align Technology. We hypothesized that during clear aligner orthodontic therapy, the use of adjunctive high-frequency vibration can minimize the decrease in tooth length due to root resorption, compared to cases treated with clear aligners alone. The null hypothesis is that there is no significant difference in tooth length change between clear aligner cases treated with adjunctive HFV as compared to those that did not receive adjunctive HFV. For this retrospective study, 30 patients from 2 different sites with an average age of 26 ± 11 years were sequentially recruited. The following inclusion criteria included: Class I malocclusion, good oral hygiene, complete permanent dentition except for third molars and initial anterior crowding ranging from 3 to 5 mm. Both groups were matched for Little's irregularity index (4–6 [moderate irregularity]). Patients with any signs of external apical root shortening observed at the preoperative radiographic examination, or if their proposed treatment included extraction of premolars and dental stripping, were not eligible for study participation. This study has been approved by the ethical committee of University of Alberta (Approval number Pro00069267). All patients were treated with Invisalign SmartTrack® clear aligners for 12 months or until completion of the treatment, whichever period was shorter (study endpoint). Fifteen patients were trained to use and activate the high-frequency vibration device (VPro5, Propel Orthodontics LLC) designed to deliver a cyclical (vibrational) force with a frequency of 120 Hz for 5 min/day (HFV group). To serve as the control, 15 patients did not receive adjunctive high-frequency treatment. Both groups were matched for the malocclusion and number of aligners that were used. Since there is no operator difference in handling the cases between the two sites as there would be in regular fixed orthodontic cases, using clear aligners from both sites was an acceptable match. The compliance with the use of the vibrating device was confirmed by the onboard software that detects when and whether or not the patient uses it. Cone beam computed tomography (CBCT) scans (i-CAT™-Imaging Sciences International; Hatfield, Pennsylvania, USA) were taken for all patients before (T1) and after (T2) orthodontic treatment. The specifications of the CBCT are 16 cm width × 13 cm height, 120 kVp, 24 mAs, 20 s scan time, 0.3 mm voxel size, and 303 basis projections. All subjects were provided with a protective lead apron. After finishing the treatment, the DICOM files (Digital Imaging and Communications in Medicine) from the original T1 and T2 scans were imported to Mimics software (version 10; Materialise, Leuven, Belgium) to accurately measure the tooth length. The sample size of the study was calculated with G Power version 3.1.9.2 based on 5% statistically significant level and power of 80% to detect meaningful differences of 0.4 mm between the groups. According to that, the sample size of this research was adequate to demonstrate differences in the degree of root resorption, if any, between the studied groups. In the above formula, D is the tooth length, X is the transversal position (relation to X-axis), Y is the anteroposterior position (relation to Y-axis), Z is the vertical position (relation to Z-axis), 2 is the point on the incisal edge, and 1 is the point root apex [Figure 1]. Blinding of either the clinician or patients to the intervention was impossible. However, the clinician who analyzed the CBCT measurements was blinded regarding the groups to which the participants belonged. All data were labeled with codes and were transferred to a statistician who was also blinded regarding the patients' groups. Ten subjects' CBCT scans were randomly selected. The tooth length measurements were performed twice by the same investigator with a 15-day interval to measure the intra-examiner reliability. Internal consistency of CBCT measures was confirmed, and the intra-examiner agreement was accepted (Cronbach's alpha ≥0.8). Statistical analysis was performed with SPSS Version 21.0 (SPSS Inc., Chicago, Illinois). The Shapiro–Wilk test was used to verify normal distribution of the data. A paired t-test was performed to detect root resorption within each group. Cronbach's alpha statistical test was used to measure reliability in measurement. The HFV group demonstrated a nonstatistically significant change in tooth length as indication of non-significant root resorption [Table 1] and [Figure 2]. The control group demonstrated a statistically significant change in tooth length as an indication of significant root resorption in all measured teeth [Table 2] and [Figure 3]. When comparing the difference between the two groups (intergroup comparison), the HFV group demonstrated greater preservation of tooth length for all teeth evaluated. 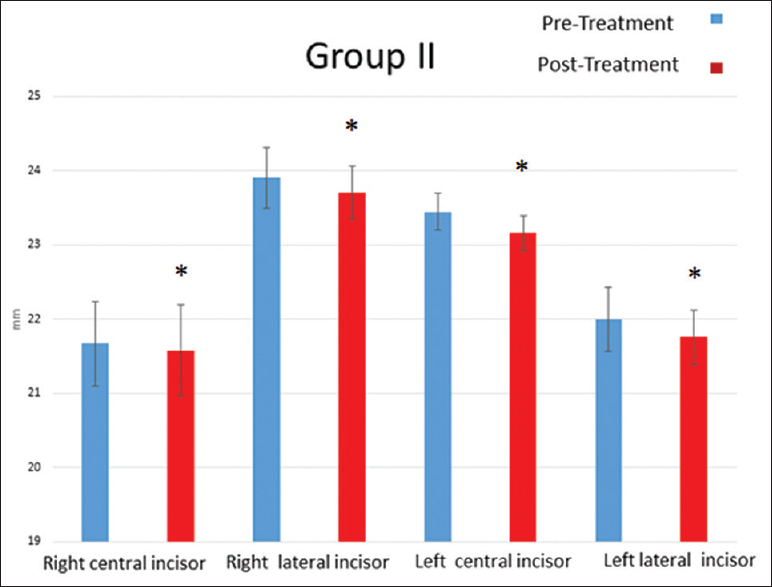 The difference was statistically significant in the right central incisor (P = 0.01) and the left central incisor (P = 0.01), while the right lateral incisors (P = 0.50) and left lateral incisor (P = 0.57) demonstrated a nonstatistically significant difference [Table 3]. The aim of this research study was to investigate the possible effect of high-frequency mechanical vibration on tooth length changes as an indication of root resorption when used as an adjunct to clear aligner orthodontic treatment. Patients were treated by two equally experienced operators using the same orthodontic aligner system, treatment planning, and default aligner change rate. All CBCT measurements were made by the same examiner who demonstrated accurate repeatability in measurements, was blinded to treatment group assignment and did not participate in treatment of the patients. The accuracy of CBCT in measuring the tooth length has been confirmed in previous in-vitro CBCT studies., The results of the present study showed that all the examined teeth suffered from root resorption. However, the resorption was non-significant within the group that received adjunctive HFV treatment. A potential explanation for the reduced external apical root resorption seen with the application of adjunctive HFV is the increased blood circulation and altered tissue perfusion in the target tissue demonstrated after different vibration regimens.,,, The increased vascularity and circulation has been postulated to minimize the hyalinization, thus leading to less orthodontic-induced root resorption. Recently, a study demonstrated that 5 min of HFV (120 Hz) was catabolic when applied in the presence of orthodontic force. Combining orthodontic force with adjunctive HFV resulted in statistically significant reductions in bone density in the region of interest around the maxillary first molar, compared to the control or orthodontic force alone. This was preceded by an increase in osteoclasts and osteoclast precursors. It was shown that all osteoclasts were on the alveolar bone surface rather than the root surface, which argues against the idea that HFV may contribute to root resorption. Rather, as the author stated, HFV may actually prevent root resorption by decreasing the bone density through which roots are moved. Therefore, this catabolic effect presents another potential explanation for the non-significant root resorption witnessed among the HFV subjects. The 5-min/day time frame used in this trial is based on research with 120 Hz demonstrating significant changes in alveolar bone remodeling. Future studies may be conducted to evaluate the effect of fixed appliances on root resorption in the absence or presence of HFV to further validate the findings in this research. Based on the results of the current study, both study groups had reduction of the tooth length; however, in the high-frequency vibration group, the reduction was both statistically and clinically non-significant. High-frequency vibration could potentially be beneficial as an adjunctive tool to orthodontic treatment in patients with high susceptibility for root resorption. Ngan DC, Kharbanda OP, Byloff FK, Darendeliler MA. The genetic contribution to orthodontic root resorption: A retrospective twin study. Aust Orthod J 2004;20:1-9. Kocadereli I, Yesil TN, Veske PS, Uysal S. Apical root resorption: A prospective radiographic study of maxillary incisors. Eur J Dent 2011;5:318-23. Paetyangkul A, Türk T, Elekdağ-Türk S, Jones AS, Petocz P, Darendeliler MA, et al. Physical properties of root cementum: Part 14. The amount of root resorption after force application for 12 weeks on maxillary and mandibular premolars: A microcomputed-tomography study. Am J Orthod Dentofacial Orthop 2009;136:492.e1-9. Nimeri G, Kau CH, Abou-Kheir NS, Corona R. Acceleration of tooth movement during orthodontic treatment – A frontier in orthodontics. Prog Orthod 2013;14:42. Katchooi M, Cohanim B, Tai S, Bayirli B, Spiekerman C, Huang G, et al. Effect of supplemental vibration on orthodontic treatment with aligners: A randomized trial. Am J Orthod Dentofacial Orthop 2018;153:336-46. Leethanakul C, Suamphan S, Jitpukdeebodintra S, Thongudomporn U, Charoemratrote C. Vibratory stimulation increases interleukin-1 beta secretion during orthodontic tooth movement. Angle Orthod. 2016;86(1):74-80. Ercoli F, Tepedino M, Parziale V, Luzi C. A comparative study of two different clear aligner systems. Prog Orthod 2014;15:31. Little RM. The irregularity index: A quantitative score of mandibular anterior alignment. Am J Orthod 1975;68:554-63. Costopoulos G, Nanda R. An evaluation of root resorption incident to orthodontic intrusion. Am J Orthod Dentofacial Orthop 1996;109:543-8. Artun J, Smale I, Behbehani F, Doppel D, Van't Hof M, Kuijpers-Jagtman AM, et al. Apical root resorption six and 12 months after initiation of fixed orthodontic appliance therapy. Angle Orthod 2005;75:919-26. Baumrind S, Korn EL, Boyd RL. Apical root resorption in orthodontically treated adults. Am J Orthod Dentofacial Orthop 1996;110:311-20. Wierzbicki T, El-Bialy T, Aldaghreer S, Li G, Doschak M. Analysis of orthodontically induced root resorption using micro-computed tomography (Micro-CT). Angle Orthod 2009;79:91-6. Smale I, Artun J, Behbehani F, Doppel D, van't Hof M, Kuijpers-Jagtman AM, et al. Apical root resorption 6 months after initiation of fixed orthodontic appliance therapy. Am J Orthod Dentofacial Orthop 2005;128:57-67. Linge BO, Linge L. Apical root resorption in upper anterior teeth. Eur J Orthod 1983;5:173-83. Sherrard JF, Rossouw PE, Benson BW, Carrillo R, Buschang PH. Accuracy and reliability of tooth and root lengths measured on cone-beam computed tomographs. Am J Orthod Dentofacial Orthop 2010;137:S100-8. de Almeida MR, Marçal ASB, Fernandes TM, Vasconcelos JB, de Almeida RR, Nanda R, et al. 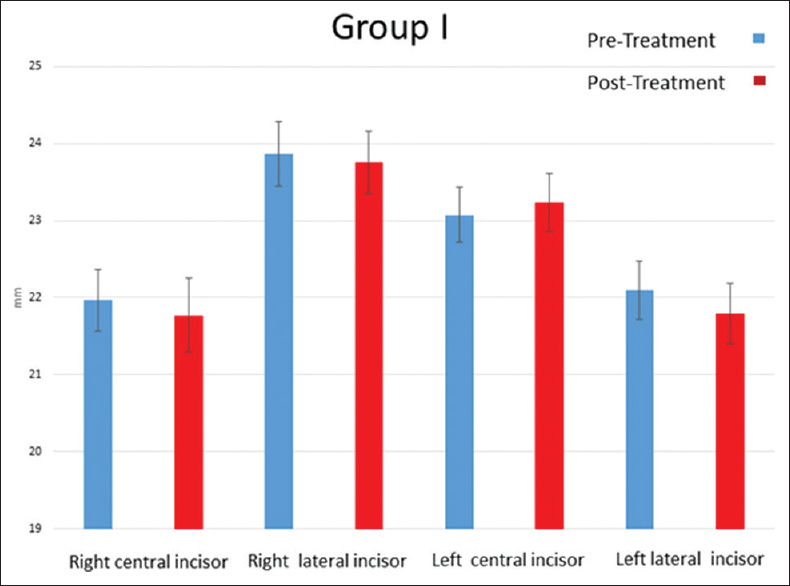 A comparative study of the effect of the intrusion arch and straight wire mechanics on incisor root resorption: A randomized, controlled trial. Angle Orthod 2018;88:20-6. Alikhani M, Khoo E, Alyami B, Raptis M, Salgueiro JM, Oliveira SM, et al. Osteogenic effect of high-frequency acceleration on alveolar bone. J Dent Res 2012;91:413-9. Rubin C, Recker R, Cullen D, Ryaby J, McCabe J, McLeod K, et al. Prevention of postmenopausal bone loss by a low-magnitude, high-frequency mechanical stimuli: A clinical trial assessing compliance, efficacy, and safety. J Bone Miner Res 2004;19:343-51. Fry JR, Cheek CC, Paterson RL, Proffit WR. Long-wave cycles in the position of erupting human premolars. Arch Oral Biol 2004;49:1007-13. Prisby RD, Lafage-Proust MH, Malaval L, Belli A, Vico L. Effects of whole body vibration on the skeleton and other organ systems in man and animal models: What we know and what we need to know. Ageing Res Rev 2008;7:319-29. Alikhani M, Alansari S, Hamidaddin MA, Sangsuwon C, Alyami B, Thirumoorthy SN, et al. Vibration paradox in orthodontics: Anabolic and catabolic effects. PLoS One 2018;13:e0196540. Kau CH. A radiographic analysis of tooth morphology following the use of a novel cyclical force device in orthodontics. Head Face Med. 2011;7:14. Acar A, Canyürek U, Kocaaga M, Erverdi N. Continuous vs. Discontinuous force application and root resorption. Angle Orthod 1999;69:159-63. Sawicka M, Bedini R, Wierzbicki PM, Pameijer CH. Interrupted orthodontic force results in less root resorption than continuous force in human premolars as measured by microcomputed tomography. Folia Histochem Cytobiol 2014;52:289-96. Maltha JC, van Leeuwen EJ, Dijkman GE, Kuijpers-Jagtman AM. Incidence and severity of root resorption in orthodontically moved premolars in dogs. Orthod Craniofac Res 2004;7:115-21. Feller L, Khammissa RA, Thomadakis G, Fourie J, Lemmer J. Apical external root resorption and repair in orthodontic tooth movement: Biological events. Biomed Res Int 2016;2016:4864195. Brezniak N, Wasserstein A. Orthodontically Induced Inflammatory Root Resorption. Part I: The Basic Science Aspects. Angle Orthodontist 2002;72:175-79. Alikhani M, Lopez J.A., Alabdullah H, Vongthongleur T, Sangsuwon C, Alikhani M, Alansari S, Oliveira S.M. J.M. Nervina J.M., Teixeira C.C. High-Frequency Acceleration: Therapeutic Tool to Preserve Bone following Tooth Extractions. J Dent Res 2016;95:311-8.